Over 16,000 sq. ft. of outdoor scares! Sac Cirque performances on select dates. Patrons must observe all posted haunted house rules. Ages 12 and under must be accompanied by an adult. 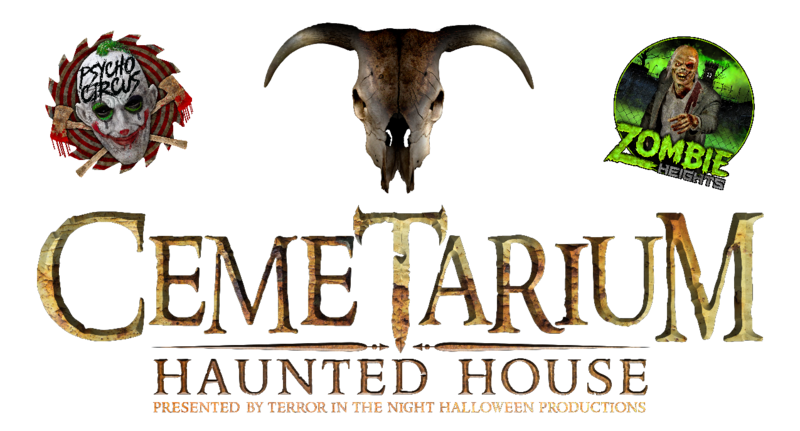 Cemetarium Haunted House reserves the right to refuse service to anyone. No food or drink in any attraction. No photography or video recording of any kind in any attraction. Cell phones must be turned to vibrate or off and be put away before entering any attraction. WE ARE NOT RESPONSIBLE FOR LOST OR DAMAGED CELL PHONES OR ANY PERSONAL PROPERTY. Please call ahead when forecast predicts rain! Although we can operate in light to moderate rain it is advisable to check with us first! Cemetarium Haunted House 7983 Arcadia Dr.